On July 4th, thousands of Londoners attended Wireless Festival in the park in London. Then, apparently, hundreds left as Mr. Kanye West decided to go on a 15 minute rant about his dreams and how the fashion world once again seems to be crushing them one by one. Excuse me while I get a tissue. Well let's see here. Who did Kanye call out this time? Well, he hit on Nike, he hit on Gucci and on Louis Vuitton and more or less called the groups racist. Hmmmm. Then he says Pharrell designed for them but having another "black man" design for them would be too much. Apparently, they are trying to keep him from chasing his dreams. 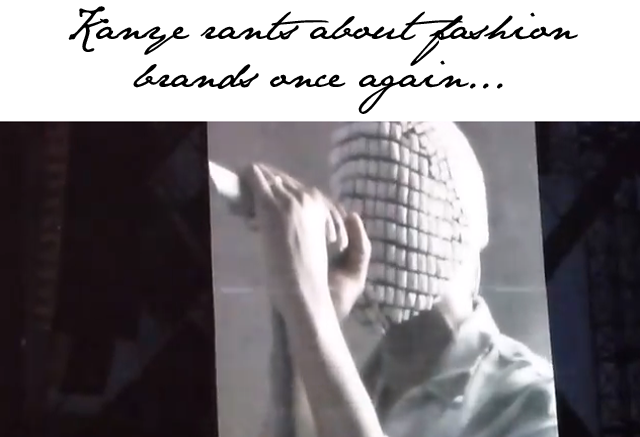 And all of this being said while Kanye makes his own fashion statement wearing a rather strange mask, which he claims is a bigger statement against the idea of being a celebrity or being a "black man that's trying to do fashion and sh*t." How elegantly phrased, Mr. West. Confused yet? I just don't even know where to start or finish this whole "news piece." I've already written an open letter to Kanye West , concerning his first delusional outburst at Louis Vuitton. I was hoping Mr. West would seek help for his obvious issues. But alas, here we are again. Seriously, I do hope that all of this is truly just for show. I hope that Kanye realizes in making such absolutely ridiculous comments he is getting stories like this written about him. But then I hope he steps off the stage and thinks, "wow, I gave them a show but don't believe a word of the crap that just spewed from my lips." One can only hope. Until then, we'll sit back and shake our heads at Kanye's clear misunderstanding of the whole fashion world and the way in which it works.